Unlike countries, which were situated on the Roman limes or within the Roman empire, the Czech Republic unfortunately does not have many museums overloaded with artefacts of Roman military equipment. Nevertheless, even in the Czech Republic there are a few interesting places for Roman military enthusiasts. First of them is obviously the Regional museum in Mikulov, where many items from Mušov-Burgstall are displayed. Another one is (quite unexpectedly) the Opočno castle in the Hradec Králové region in the Rychnov nad Kněžnou district. The Opočno castle takes pride in a large collection of historic weapons, which was gathered here by the Colloredo-Mansfeld family. The collection contains unique examples of Oriental weapons (from Japan, China, Thailand, Iran, etc. ), historic firearms from renowned gunsmiths, European plate armours, executioner's swords and many other interesting artefacts. Part of the collection is also one Roman military helmet. Visitors can see the helmet in the Knight Hall of the castle. Finding spot and origin of the helmet are unknown. Allegedly it was purchased for the Colloredo-Mansfeld collection in 1927 in Vienna from the estate of the fabricant and passionate collector Josef Salzer. Previously it had belonged to a private collection of Karl Gimbel in Baden-Baden, Germany. Unfortunately there is no more information about its origin. The helmet is made of iron. The helmet's bowl is roughly hemispherical, only at the rear it is a bit prolonged and is continued by a neck guard, which appears a little lower under the rim of the bowl, it has two steps and is a bit wider than what we can see on older types of Roman helmets. The rear part of the helmet leading to the neck guard has three horizontal, slightly embossed ridges. There are cut-out ear holes on both sides (without any ear protection), which allowed soldiers to hear better. On the sides of the helmet's bowl above the cheek guards we can see small, decorative rivets allegedly silver or silvered and with red filler. (There are two such rivets above each cheek guard - the rivets above the left cheek guard are later reconstructions according to the information from castle's staff. It is possible that some other parts of the helmet are later reconstructions as well.) Another decorative element are the embossed "eyebrows" on the front side, which are in this case a bit atypical and there are only a few other examples of Roman helmets, where similar "eyebrows" can be seen (see below). Usually this decoration is a bit elongated and with slightly S-shaped design, or it is in the form of one long curved line - in this case it most resembles the eyebrows. The helmet's rims were probably coated with a thin bronze plate. A small part of it can be seen on the front rim of the right cheek guard. The cheek guards are fastened to the bowl with hinges and are narrower than other extant cheek guards related to this type of helmets. In the upper part of the cheek guards we can see again three horizontal embossed ridges. In the lower part there are small holes for a chin strap. The helmet does not have a brow band. It is 30 cm high, 17.5 cm wide and 26.5 cm long. 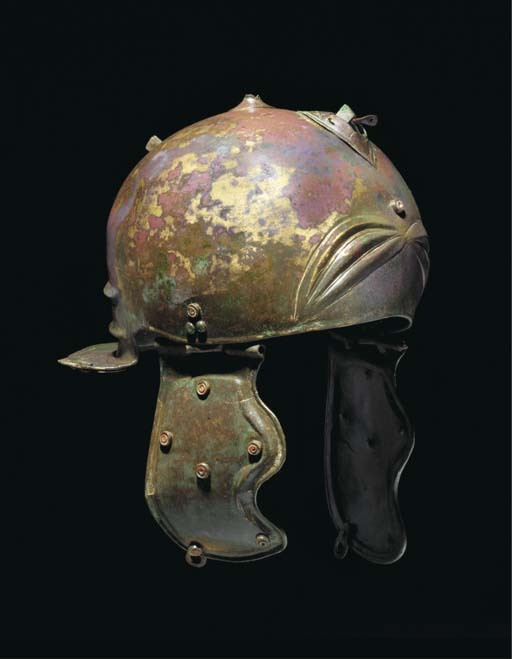 The closest similar example is a helmet currently in a private collection, which was before displayed in the Carnuntum museum and is published in the catalogue Humer, F.: Legionsadler und Druidenstab, St. Pölten, 2006. It shows all the main features like the helmet at the Opočno castle and is very similar to it. The most significant difference can be seen on cheek guards, which are bigger, with more pronounced cut in the front part and are also decorated with rivets with red filler. Another difference is the higher number of decorative rivets on the helmet (one around the middle of the front part, two more are by the right and left rim of the neck guard). 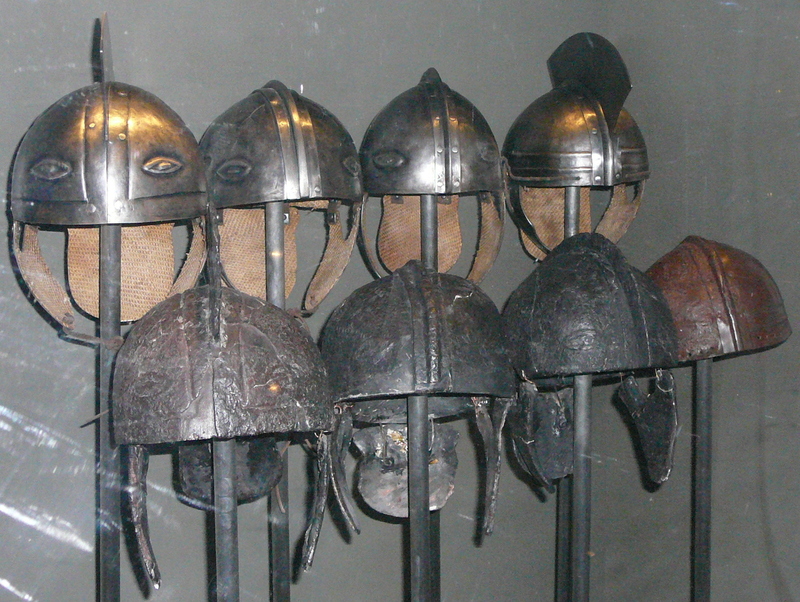 There is another helmet, which thanks to the distinct shape of the “eyebrows” resembles the one from the Opočno castle. In this case, however, the “eyebrows” are a bit rotated with their outer parts downwards. This helmet too is in private hands, before it was part of the Axel Guttmann collection (published in Junkelmann, M.: Römische Helme, Berlin, 2000). However, notable differences are more numerous this time. Again there is different number and location of decorative rivets and different shape of cheek guards. Compared to the Opočno helmet the neck guard is lower, it is perpendicular to the helmet's bowl and there are only two embossed ridges. There are no cut-out ear holes. And there is also a rather peculiar crest holder on this helmet. The helmet is made of bronze. Another helmet with a similar, distinct shape of "eyebrows" was found in Klakar in Croatia and is currently displayed in the Archaeological museum in Zagreb. In a simplified form we can see this decorative element on some late Roman helmets from Intercisa (currently in the Hungarian National Museum in Budapest). 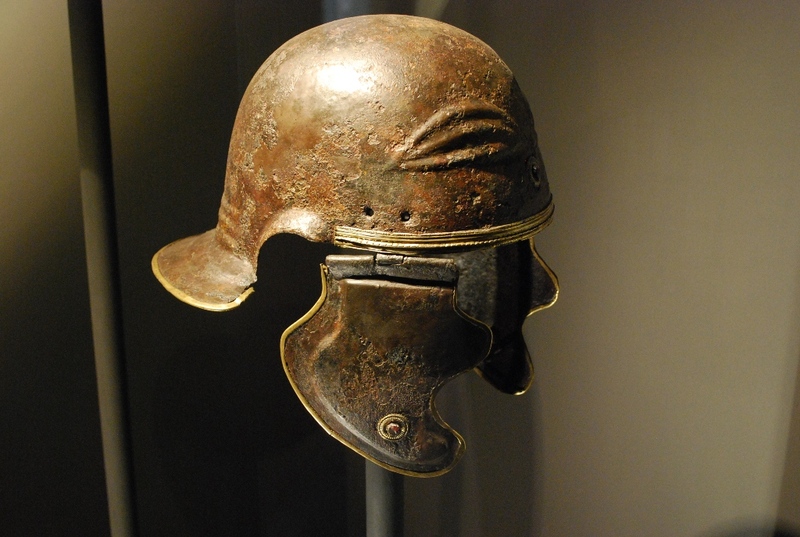 Generally, with regard to all the above mentioned characteristic features the helmet belongs to a wider group of so called Weisenau type or also Imperial Gallic C type (according to Robinson's typology) helmets. Although the helmet was previously dated by Ing. 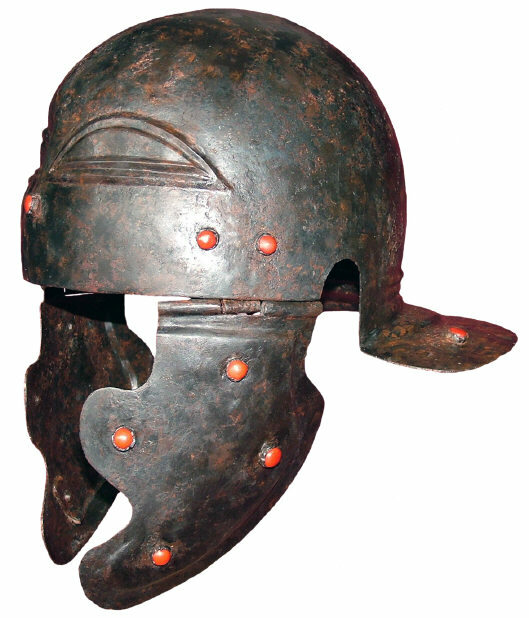 Ctirad Beneš to the 4th century A. D., this type of helmets was actually mostly in use during the 1st century A. D.
As mentioned before, the helmet can be seen in the Knight Hall of the Opočno castle. You can see pictures of the helmet below. I would like to thank Mr. Milan Junek and Mr. Josef Jirák from the Opočno castle for their kind help, information about the helmet and permission to use photos of the helmet in this article. I would also like to thank Mr. Jens Horstkott for recognising the helmet as the one previously belonging to the Karl Gimbel collection and for help with verifying the helmet's history. Beneš, C.: Přilba, ochrana i ozdoba válečníka, Praha, 2003, p. 12. Bongartz, A.: Studien zu römischen Helmen: Untersuchungen zu den Funden römischer Infanterie-und Kavalleriehelme vom Ende der Republik bis zum 3. Jahrhundert n. Chr. (Dissertation), Universität Köln, 2013, p. 205, I 189. Rudolph Lepke's Kunst-Auctions-Haus: Waffen- und Kunstsammlung Karl Gimbel: Baden-Baden/Ausst. 27. Mai bis 29. Mai 1904; Versteigerung: 30. Mai bis 3. Juni 1904, Berlin 1904, Los Nr. 35, Tafel 7. Waurick, G.: Die römische Militärhelme von der Zeit der Republik bis ins 3. Jh. n. Chr., Mainz, 1976, Kat. Nr. 77, p. 219.